February was slow. March bounced back to above the 2012 trend with 773 deals coming together. This is about 4% over the March 2012 result. 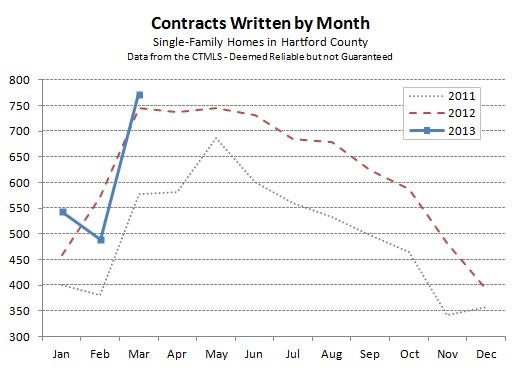 Since the market continues to be very active, we still believe that February was an aberration and should not be interpreted as weakness in the single-family real estate market in Hartford County. Buyers in many towns, and at a variety of price points, are frustrated by the low number of quality homes available for sale. Previous points we have made about inventory levels, the pace of new listings, and the opportunities for sellers all still stand. This is a great time to list a home since there are buyers backed up and waiting for new opportunities. 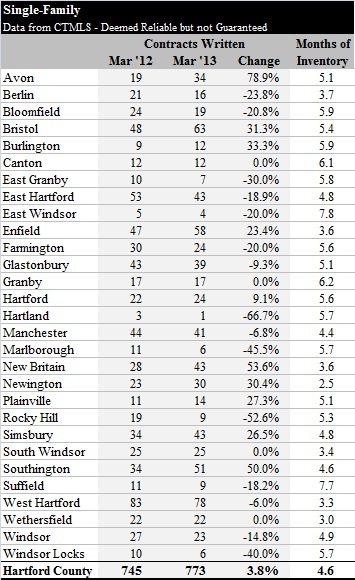 It does vary by town, but most towns are in much better shape than they were last year or the year before. Rather than rehashing things we have been writing recently, I’ll leave it at this – call if you’re interested in selling. Every property is different, so it’s easiest to have a conversation about your specific situation. We’ll be happy to help you best position your home to make it as attractive as possible to buyers.